It's Halloween so it's time to show off your killer bunny costume. Oh, not "killer-bunny" as in a weapon-wielding rabbit costume (even though that's awesome and we'd support that. Actually, we sell one of those... if you're interested). But your bunny disguise is of the adorable variety. It's a cute fluffy jumpsuit featuring an attached hood with floppy ears. It's cozy, warm and basically, the perfect trick-or-treating costume so there's only one thing on your mind now: collecting as much Halloween candy as possible. No need to spend more time than necessary on anything extra, like doing your makeup, because we have a great kit that will polish your spunky bunny look: the rabbit makeup kit. It completes your look faster than a bunny twitches their nose! You'll receive a palette containing gray, pink and white face makeup that can be easily removed with soap, warm water, and a washcloth. The included brush and applicator wand helps with easy application while the black makeup stick creates precise lines on the face. 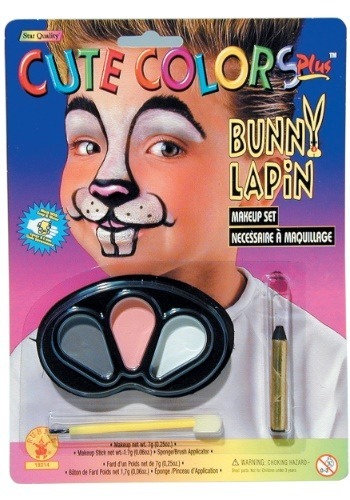 This rabbit makeup kit can help create all types of bunny looks. Be a generic bunny or a famous one like Rodger Rabbit or Bugs Bunny.